(November 10th, 2017) – Giovanni Soldini and the Maserati Multi70 Team are setting out on a new challenge – breaking the record from Hong Kong to London, retracing the 13.000 miles of the Tea Route. 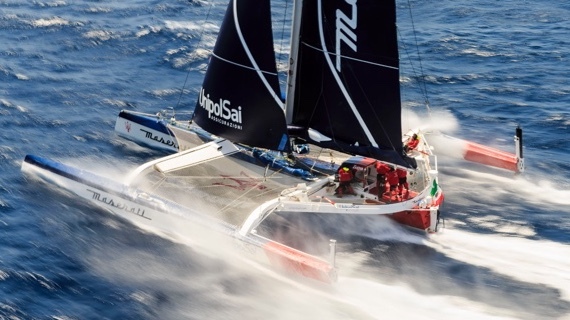 Giovanni Soldini aims to attempt the record breaking run of 13,000 miles, 24,000 kilometres non-stop, in January 2018 aboard the Maserati Multi70 trimaran along with four expert ocean racing sailors including Sébastien Audigane (FRA), Guido Broggi (ITA), Oliver Herrera (ESP) and Alex Pella (ESP). 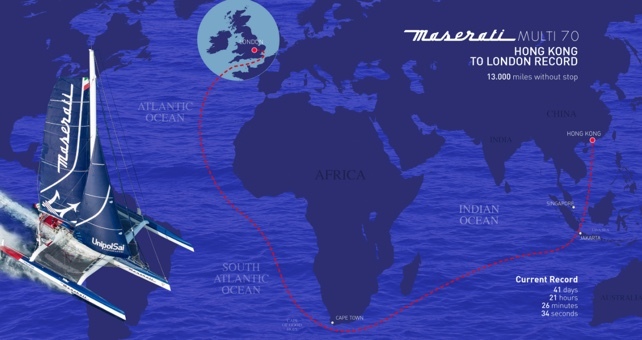 This is an uncommonly long route for a 70-foot multihull such as Maserati Multi70. To minimize the risk of damage, instead of sailing in foiling mode the boat will be set up in MOD configuration, although the work to develop the boat’s foiling dagger boards continues with the support of the eminent high-performance yacht designer, Guillaume Verdier. The main phases of the course are, first, out of Hong Kong and across the China Sea, which is a waterway highly congested by cargo boats and fishing vessels. Then they sail across the island-strewn Java Sea, including negotiating a 15-mile-wide strait between the islands of Java and Sumatra. Next, the team will cross the Indian Ocean and the equator to round South Africa’s Cape of Good Hope the “wrong” way, i.e. against the prevailing west to east winds. After South Africa the boat will head up the South Atlantic Ocean to re-cross the equator. It will be winter in the North Atlantic, meaning a strong chance of encountering low pressure systems that turn into ocean storms. “The story of the Clipper routes of the Victorian age is fascinating. Being first in London meant selling tea at three times the price of those who arrived later. It was on these routes that people first started to think about how to make boats sail faster and perform better and this was the origin of modern yacht design.